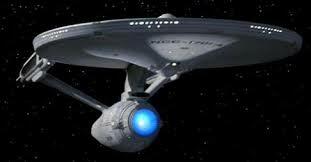 As a boy, I wanted to be on the crew of the USS Enterprise, adventuring among the stars. Now in writing science fiction, I at least have the chance to explore such adventures in the imagination. But I tend not to. Why not? Because I can’t see travel to the stars as a practical proposition, the distances are just too great. Many people, including many SF writers, are more optimistic, citing other achievements like flight or electronic communications which once seemed impossible but now with the advance of technology are everyday. Yet with star travel the barriers are not just technological but stem from the law of physics. Manned interstellar flight may never be feasible, or if feasible, may never happen because of the expense. The expense constraint might seem trivial when considering the superior technology and presumably wealth of mankind in the future. But our wealth and technology are already vastly superior to those of the 1960s yet we have not repeated the moonflights of that era. Why not? Because there is no sufficient benefit to set against the cost. Work astronauts might do on the moon can be done far more cheaply by an unmanned probe. The same might well hold for manned flight to the stars if it should ever be technologically feasible. Now for the feasibility. I see three interlinked problems – energy requirement, journey duration, and journey survivability. The first issue is the energy needed to accelerate to the speeds required for a reasonable journey duration. Chemical rockets are no use. Nuclear fission or even fusion are too inefficient in terms of mass-to-specific impulse ratio. An ion drive might be a possibility, but the acceleration possible is very low – pointing to very long voyages – and the drive requires energy to create the ions. Even anti-matter (assuming it could be produced in sufficient quantities) and matter would be prohibitive. The problem becomes much worse when account is taken of the fuel that has to be carried in order to decelerate at the other end – NASA quotes anti-matter requirements on the scale of super-tankers. Picking up fuel from space, for example stray hydrogen atoms, has been suggested as a solution. However, it seems likely that the drag from the scooping mechanism would largely nullify the benefit of any hydrogen gathered this way – and the interstellar medium (ISM) around our Sun is in any case rather empty. Picking up a larger fuel source, such as a comet, would require slowing down to the comet’s speed, hence multiplying journey times and energy requirements. Yet another proposed solution is the solar sail, riding on either the solar wind or a space-mounted super laser. However, the solar wind’s speed is only about 0.1% to 0.2% of the speed of light, so that still means journeys to the near stars of thousands of years. Solutions that side-step the constraints of relativity by postulating wormholes are too remote from today’s technology for practical discussion. One framework for considering such concepts is Nickolai Kardashev‘s idea, popularised by Michio Kaku, of levels of civilisation defined by their characteristic energy usage. A Type I civilisation has learnt to master the energy of a planet, Type II that of a star, and Type III the energy of a galaxy. Interstellar travel would be achievable for a Type II civilisation, Kaku suggests, while wormholes and the like would have to await a Type III. Our own civilisation is presently well short of Type I, so we have a way to go. The second issue is journey duration. What would be an acceptable duration for a spaceflight? The Voyager spacecraft would take some 70,000 years to travel the four light-years to our nearest stellar neighbour Proxima Centauri. That is clearly too long – almost time enough to develop a new human species! Centuries, at two orders of magnitude faster than Voyager, would still seem too long, requiring multiple generations of astronauts. Sleeper ships have been suggested, but prolonged hibernation may not be possible for humans – and untended technology may not be able to operate fault-free over long time-scales. In principle, a decades-long journey might be acceptable – within a long-ish human lifetime, or at least a parent-child span. But even multiple years may be too long for actual humans – zero gravity appears to damage the human eye within less than a year, not to mention its deleterious effect on the rest of the body. Humans are not well adapted to living in space. 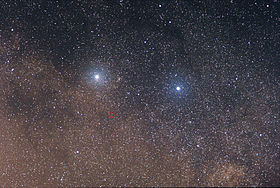 Proxima Centauri (circled red), with Alpha and Beta Centauri – Out of reach? That’s the third issue – can humans survive the hostility of the ISM? The emptiness of the local ISM is in this respect a positive since it reduces the chance of impact from dust particles or larger objects. However, at the relativistic speeds that would be needed – say 10% of light speed for a forty-year trip to Proxima Centauri – the impact of even micro-particles would be severe, requiring heavy shielding which in turn would add to mass and so to fuel needs. Such shielding would also be needed to protect the astronauts from cosmic rays – and, at relativistic speeds, from the impact of ordinary electro-magnetic radiation. The effect of low- or zero-gravity on the body has already been mentioned. Rotating the space ship, or its living quarters, might help, but the engineering requirements would be demanding, and rotation requires energy. There would be the psychological and health problems of living in a confined space for years, feeding and watering the crew, and maintaining the ship with only on-board resources. Multiyear flights would require an entire ecosystem, with waste recycled for food and water, and – at the extreme – the dead recycled to feed the living. One nice solution to the shielding and habitat problem would be to carve out an entire mini-world inside an asteroid – the rotating ‘terrarium’ of Kim Stanley Robinson‘s 2312, which has its own miniature internal ‘sun’. This would be comfortable, with ‘gravity’ from the centrifugal force and a generous ecosystem for the astronauts, but the energy required to accelerate a trillion-ton object like this would make it impractical for interstellar flight. My own thought is that the triple conundrum of journey duration, energy budget, and liveability may simply not be solvable for manned spaceflight. Rather, we may have to content ourselves with unmanned probes for the foreseeable future. Probes can withstand much greater acceleration and radiation than humans, require no life support or recreational space, and are expendable. If enough of them are launched, a few may fall to the hazards of the ISM, but some may get through to another star system, eventually. Meanwhile, over sufficient timescales, humans themselves may develop further and make a (voluntary) transition to machine form. Then, being more or less equivalent to probes themselves, with long lives and minimal needs, they could make journeys of long duration – albeit that their loss would presumably not be equivalent to that of an unmanned probe. But this topic is again beyond practical discussion today.